When I was at uni, a friend and I spent most of the money in our bank accounts to travel interstate to attend a conference at which one of our heroes was speaking. We ended up having dinner with him and he remained a mentor of mine for decades. I was thinking about this when the always thoughtful Carol Lawson asked me to elaborate on a comment I made in last week’s post about mistakes we had made in the 12 year MBO/Ergo business experiment. I’ve had a need to use some professional services recently and have consequently come across some very competent people. And then, someone came along who appeared to operate at a different level. What is it about them that puts them in a new category? In a great little ‘rites of passage’ book called Secret Men’s Business, John Marsden, among many other things, talks about how a mark of maturity is knowing ‘when to break the rules’. (I recall the example of ignoring a red pedestrian light in the middle of the night when there is little traffic around.) People who stand out in their profession have a different relationship to the rules of the game. Some of the ‘very competent’ people I have been working with practice their profession by navigating the rules of the game. The rules are king. These people are good because they have learned well the domain in which they operate. But the standout practitioners act above the rules. It’s not that they ignore them, they have mastered them to the extent that it is as if they make their own in order to achieve their desired outcome. This mastery is everywhere once you see it. There are any number of deli/cafes around: these great little businesses add a person touch to the ‘formula’. But some places, like Annie’s Provedore own the rules. They are masters of the domain. There are dozens of champion AFL players, but the Chris Judds of the world somehow change the game through the strength of their talent, they are more than great players. The David Bowies own or invent a genre, they don’t just participate in it. Chef’s, engineers. Facilitators and gymnasts, economists or politicians. Doesn’t matter what game we play, there are masters among us, people who are more than competent participants. So, back to the question. What mistakes did we make? It wasn’t so much that we made discrete mistakes as much as we were seeking to model something we had hunches and inclinations about, but had not done before. We were participants in an emerging genre. We were mimicking others shamelessly as we went; for example, we took on Jack Stack’s Open Book management. And yes, we made up rules of our own on everything from performance reviews to philanthropy. But what we didn’t have was experience. We hired people we assumed would ‘get it’ and they didn’t and that caused truck loads of pain. There is no shortcut to mastery. The mistakes we made were not so much ‘we did X when we should have done Y’, it was more, ‘we tried our best and did good’, but we were tutors not masters. When we see people applying formulas, it is a sign we are in the presence of competence, or if it is an emerging area, creativity or ambition, but not mastery. The professionals I have been dealing with in recent weeks have not made any mistakes, it’s just that they do their job by navigating the rules. It’s so different when you come across someone who understands the outcome and cuts clear paths toward it; someone for whom the rules of the game are servants rather than constraints. What does this all mean? What is applicable? Simple really; figure out which competencies matter most to you. Find some masters. Mimic shamelessly. Learn from them. Read their stuff, watch their videos, listen to their podcasts. Write to them, go to conferences where they are, and invite them to have a drink with you. Even if, as it did for for me and my uni mate, it costs you your last dollars. It won’t safeguard against mistakes, but it will offer inspiration to move past mere competence. 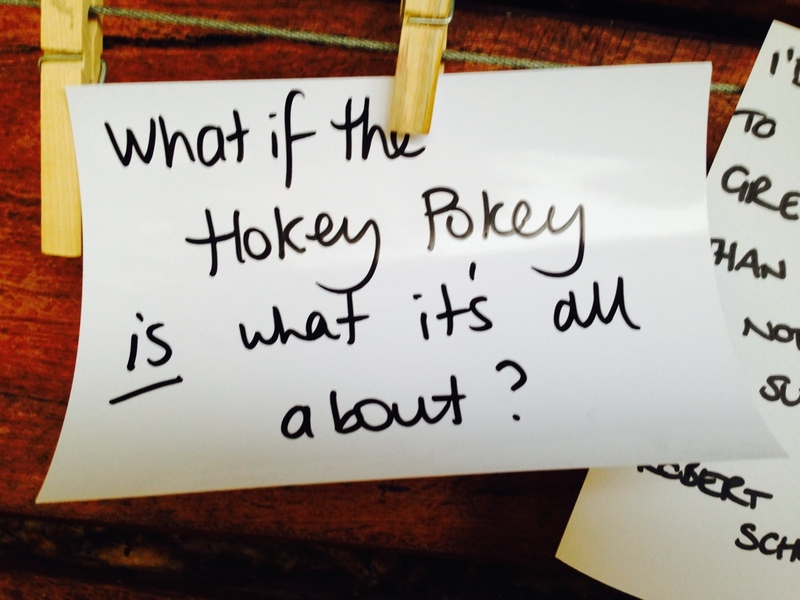 Maybe hokey pokey is what it’s all about.